Next time you visit the Bream Creek Farmers Market, you may well find yourself day-dreaming of your own sea change and the perfect coastal-rural lifestyle of the Bream Creek region…. And if you do, well you just can’t beat local knowledge. When it comes to houses and property, Kate Storey Realty provides clients with quality services to meet all of their requirements. 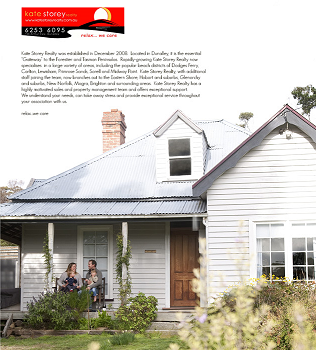 Kate Storey Realty was established in Dunalley in 2008 and now also specialises in a large variety of areas, including the popular beach districts of Dodges Ferry, Carlton, Lewisham, Primrose Sands, Sorell and Midway Point. Kate Storey Realty, with additional staff joining the team, now branches out to the Eastern Shore, Hobart and suburbs, Glenorchy and suburbs, New Norfolk, Magra, Brighton and surrounding areas. Kate Storey Realty has a highly motivated sales and property management team and offers exceptional support. The BCFM Committee thank Kate Storey Realty for their generous sponsorship, without which the production of the new BCFM Cook Book would not have been possible. The following recipe for Beetroot Relish is a real winner – try making an easy Christmas canape for a cocktail party by spreading crostini with soft Tassie goats cheese and a dollop of beetroot relish on top. Quick, easy and festive to boot! At Kate Storey, we understand your needs, can take away stress and provide exceptional service throughout your association with us. Preheat the oven to 180°C. To roast the beetroot, wash and place on an oven tray, rub the beetroot with oil and bake for about 40 minutes or until soft – the beetroot should be soft when pierced with a sharp knife. Cool slightly and peel off the skins. Finely grate the beetroot using a food processor or grater. Place a saucepan over medium to high heat and without adding any oil, add the mustard seeds. When they start to pop, turn the heat down to medium, add the oil and chopped onion and fry the onion with the mustard seeds until translucent. Add the sugar, water, cinnamon, vinegar, pepper, ginger and salt and stir to combine. This will cook quite quickly in about 15-20 minutes, as the beetroot is already roasted. Simmer the mixture with the lid off to reduce any excess liquid. Pour into clean sterilised jars. Beetroot relish is delicious served with savoury pies and tarts and is a lovely addition to a cheese platter or in sandwiches.